First, funding conditions across the dollar spectrum have tightened considerably since March. 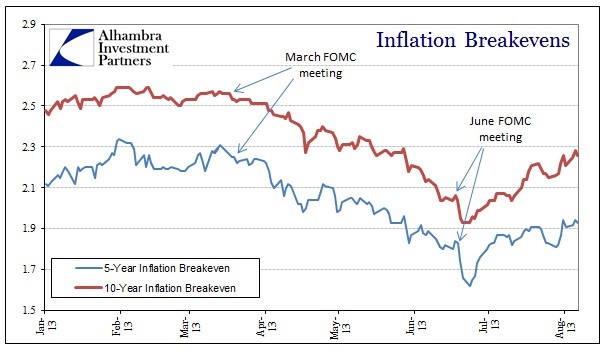 Inflation breakevens broke out of their QE trend right around the March FOMC meeting. While taper itself is a word conjured in May, there were noises about QE regret in that March meeting. The bond market may have picked up on it and reacted only marginally at first. 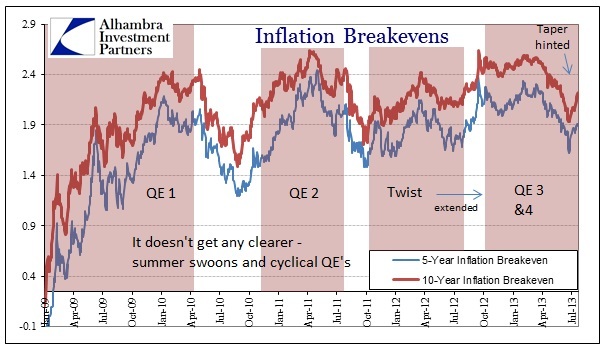 As I have said before, in the age of QE inflation expectations are almost wholly unrelated to “inflation”, rather they would be much better semantically stated as “policy” expectations. There were certainly other factors as well, including the dramatic slide in global trade (and thus the amount of ledger dollars transferred to real economy participants outside the US), which has been particularly problematic due to the short dollar position of Chinese corporates. So the net effect has been a smoldering dollar problem, growing out of both changing policy expectations and a real decline in economic momentum (particularly trade). By the time taper became a mainstream word in May, funding conditions in the more visible areas of the liquidity markets started to adjust; and not smoothly or orderly. 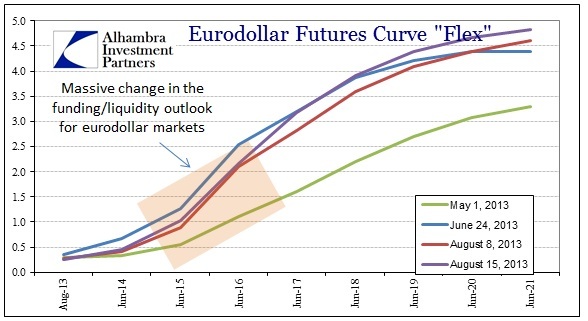 By mid-June, there had been a huge adjustment in eurodollar futures, impacting funding expectations and derivatives positions all over the banking system. The entire system had become massively leveraged to the QE universe; in other words the banking system is again leveraged to policy and not fundamentals. This sensitivity to perceived policy shifts is heightened by that volatility across funding markets. The result is exactly what we have been preaching – a massive dollar squeeze that is starting to come out in the open. There is very little ambiguity out of the TIC data for June (just released). 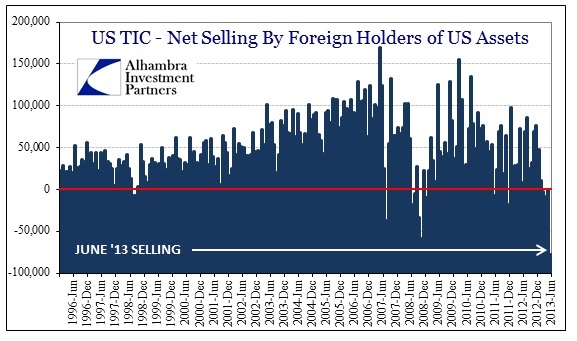 Dollar funding problems are obvious and evident in the net selling of dollar assets. The global banking system is in a synthetic dollar short position, rebuilt after the panic in 2008 thanks to central bank attempts at removing “tail risks” (or at least artificially suppressing market expectations for tail risks). Long-dated dollar assets are “funded” by short dollar liabilities, largely in eurodollars augmented by currency swaps and derivatives positions. Stress in dollar funding, including volatility in funding expectations, feeds outward into margin calls, collateral adjustments and in general rising liquidity costs. This is a tremendous warning that all is not well in the global banking system. 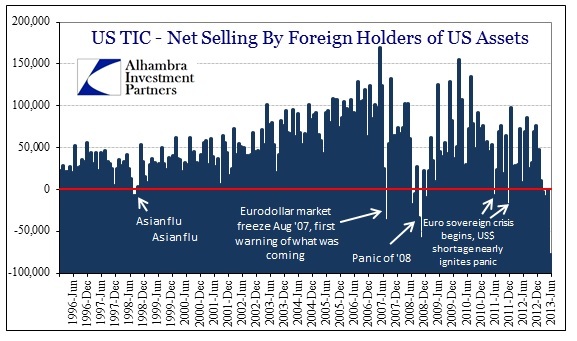 The synthetic dollar short that plagued the global asset markets starting in August 2007, creating the conditions for panic, has re-emerged in a state of stress once again. Just as the US economy, contrary to what the Establishment Survey projects through its statistical processes, is losing momentum, there is now very little room for changes in policy. As we know QE is a stress on collateral systems and availability, so re-appealing to QE is unappetizing, but eventually the dollar shortage has to receive some kind of attention. The central bank dollar swap lines might work in terms of operational considerations, but what kind of risk signal would that send to “markets”? The embedded failure of QE and ZIRP has always been the assembling of financial positions around policy. The expectation was that building off policy would be the starting point to the virtuous economic circle (including the nefarious “wealth effect”), and thus there would be little transition danger once “recovery” was entrenched. Instead, “recovery” has been lacking and policy is still the primary motivation now four full years after the Great Recession ended. The best hope for policy transition has been the Establishment Survey as a proxy for the “recovery”, but it is unconfirmed by almost every other data series. Deep down, the “markets”, when functioning like markets, don’t believe in the transition. That is what the breakevens suggest, and highly so. The question before us is whether we have reached that 1937 moment, or if there is still time to fool markets back into policy discipline again.